Speakers frequently ask me: "Why should I apply for my CSP?" If you speak to certification-granting organizations or industries, you should apply for your CSP. If you want to attend NSA CSP-only learning opportunities, you should apply for your CSP. 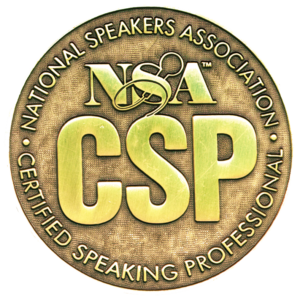 If you want to let meeting planners know that by hiring you, a CSP, they are getting a speaker with a proven track record of experience and expertise; a speaker who has earned the highest designation in the speaking profession, you should apply for your CSP. As soon as you have met the criteria, if you are a member of NSA why WOULDN'T you apply for your CSP? What this overview addresses are the requirements and processes – this does not address your platform skills which are an extremely important part of the application. "Don't even bother to do this without Kate Holgate. She's the bombdiggity. Kate is a CSP savant and has special Jedi powers that will change the game for you. The force is with her." *NSA may change their criteria each year; we will post changes here as soon as they are made public. GOOD TO KNOW ABOUT YOUR MEMBERSHIP: Put your membership on auto-renewal and keep your payment method current. Lapsed membership (even for one day) will cause your application to be rejected. Lapsed membership after receiving your CSP will prevent you from being able to renew. Link to your unedited YouTube Video (not Vimeo, etc) 45-60 minutes in length. The video can be unpublished but it cannot be private. The audio must be continuous but you can use a multi-camera shoot that reflects camera changes as long as the audio is uninterrupted. It must contain a minimum of 75% spoken word. If your model is for training and you have a lot of "downtime" in workshops where you are not speaking, make sure to use a video that has 75% of you speaking. Delete any introduction; that does not count toward to minimum time. Make sure your video represents you at your best. Videos that do not successfully demonstrate platform skills, expertise, or ethics are the most frequent reason for application denial. When NSA states that the duration must be between 45-60 minutes, they are referring to the actual time you are speaking. If you are a trainer and attendee exercises are a part of your time, you MUST make sure that YOU are speaking (just YOU) for the 45-minute minimum. Example - a 48-minute video was submitted but over 10 minutes were made up of attendee participation. That application was denied because the video did not meet the criteria. Evaluators MUST have seen you speak and MUST be in a position to hire you; they cannot simply be an audience member. Contact your Evaluators prior to including them on the spreadsheet. It's a great marketing tool and you want them to be excited to be a part of the process! "I am applying for the highest earned designation in the speaking industry and I would be grateful if you could help me." AND by contacting them via email, it will allow you to make sure all of their contact information is correct. Applicants who have passed the verification process will receive, via email, a link to your survey along with a suggested email template. It is your responsibility to send it out in an email to the clients you have listed as Evaluators on your spreadsheet. NSA will provide a deadline for the return of the evaluations. Evaluations include a brief six-question survey that the evaluators complete and are automatically returned to NSA. You likely will receive the evaluation survey link in early February. If 20 responses are not returned by the deadline, your application will be rejected. This is why we recommend including at least 30 evaluators. Each speaker's application process is different. Some need us - a lot - and want us to handle all data entry and they send us their paper calendar, paper invoices, and address book or (hopefully) links to information online and they want us to submit the application. Sometimes NSA requests a written business model. If your speaking model is different, then it's good to go ahead and provide it. Others have completed the data entry in either eSpeakers or on a spreadsheet and all they are looking for is an experienced eye to look over their application and return it to them so they can submit. The best option for you is to get your materials, the signed agreement, and payment to us by November 1 so you can take advantage of our early-bird rate. After November 1, the amount due is based on the date we receive the materials. When materials are received, we will invoice you based on that date; the invoice is payable via ACH securely through our system. In this hourly option, you and/or your admin staff have mad spreadsheet skills and are extremely detail-oriented. In this option you do ALL of the data entry, you will have run data sorts to ensure accuracy, you will have gathered all of the support material, written your business model (if it is requested by NSA), uploaded your video and all you need is for someone to look over your Presentation Spreadsheet for accuracy and do a final analysis and then bless it. Once we have looked it over, made changes and finalized it for submission, we will return it to you and you will be the one who submits the online portion and email portion of the application to NSA. Once the application has been returned to you for submission, our interaction ends. RETAINER OPTION - SPREADSHEETS GIVE YOU A HEADACHE! If you would rather have the full assistance experience - whether you need data entry, consultation on best practices about how to contact former clients, assistance with creating your business model, etc. we have an initial retainer fee starting at $750. This retainer fee covers up to 10 hours. Please keep in mind, if you need us to do data entry and you send us your presentation information on separate invoices, contacts on individual Outlook V-cards, etc., and presentation topics on post-it-notes, it will take longer than 10 hours (yes, I speak from experience). We take a much more hands-on approach in this option and we will be the ones who will submit everything to NSA. Because Kate has submitted so many applications, NSA has come to expect high standards from her. Our retainer depends on when we initially receive the bulk of your materials, signed agreement, and payment. Think you might be ready?